Rice cookers have become a MUST HAVE kitchen appliance because of their convenience and ease of use. 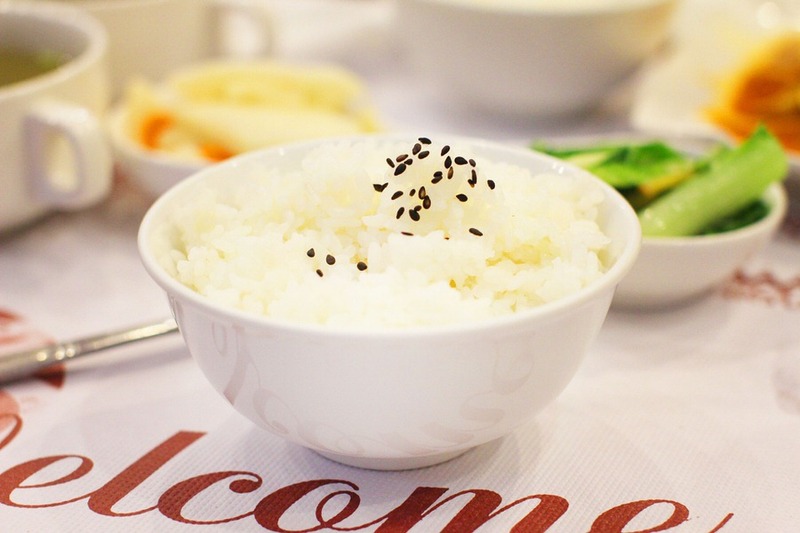 However, did you know you can use your Rice cooker for more than just cooking rice? READ ON! 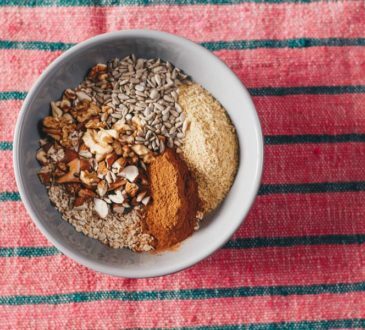 Even though their name suggests they are purposefully for cooking rice, many of them are not only useful for that purpose, although this is what they do best. These appliances are quite versatile, with so much more to offer. Like all appliances, even rice cookers were not all created equal. But why do we insist on stainless steel? First of all, stainless steel is the only non-reactive metal used in cookware. 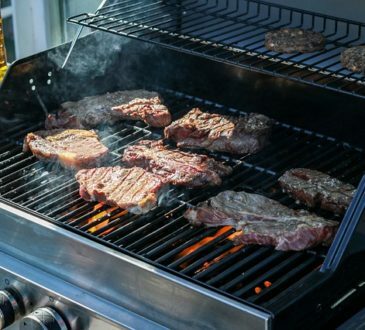 While aluminum, copper and ‘non- stick’ variations react with foods when heated, stainless steel does not react with foods cooked and in contact with its surface, so you are assured that your cooked foods remain free of toxins. But it is also important to clean your stainless steel appliance well! In addition, while preparing or cooking foods, stainless steel does not react with acidic foods or sauces, and so will not rust, peel, or pit. This makes it the safest and cleanest cookware. And because stainless steel in non- reactive and contains no harmful chemicals, the flavors and nutritional values of your foods are retained, and will not absorb unusual odors or flavors from the cooking pots. A stainless steel rice cooker is fast and easy to clean as food will not stick to it, providing you a wonderful cooking experience. It also has proper heat absorption while cooking, and heat is evenly absorbed and distributed across the cooker. Food will not stick to the stainless steel, and does not require a non- stick coating for this. There are two major types of rice cookers. The conventional rice cooker is much like using a normal cooking pot. With this, you have control over how done our food will be. If you’re a little old fashioned and want to be hands on in your food preparation, this is perfect for you. The micro computerized rice cooker calculates the amount of time needed for the rice to be cooked, and detects when it is ready. This cooker does the work for you- it determines when your food is ready. It is best suited for those who have little time to prepare the food themselves, or lots of activities that don’t allow for hands on cooking and the pressure that goes with it. There are also rice cookers with inner stainless pots that are removable, which remain completely free of rust and any kind of foreign material, and are very easy to clean, as compared to normal steel cookers. Understandably, the stainless steel may cost more than the ordinary rice cookers, but the difference in price is incomparable to the stated benefits the stainless steel provides. Having identified that stainless steel is the safest material for your rice cooker, we look at the main things to look out for when purchasing it. You’ll need to consider the type of materials the model is made. In addition to being stainless steel, you will find those with a non-stick coating. In addition, the materials tell a story of durability, depending on their fragility or sturdiness. 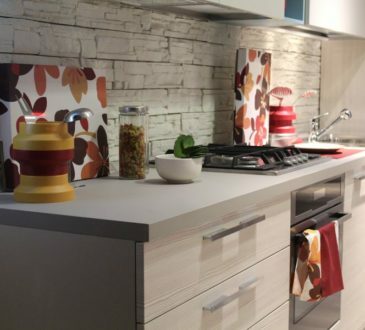 Consider too whether your preference for portability and ease of storage or placing on a kitchen is paramount. You will not want a stainless steel rice cooker that is too bulky to fit snugly in your kitchen space. The size of your rice cooker may determine the model that best suits you, and its ability. For instance, the size of your family, and other foods that you plan to cook in your stainless steel rice cooker will determine the size and capacity of the cooker you purchase. A rice cooker that provides different cooking methods and styles, such as pressure cooker and steamer, is proof of versatility. 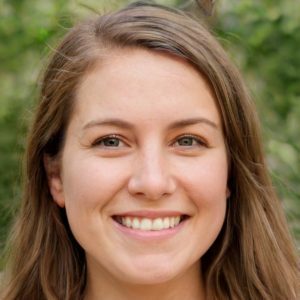 Some, in addition to this, have features that make it easy to transfer foods, retain the nutritional goodness of foods, cook other types of foods, and other features. In the language of meals preparation, this means easy to use and clean. Your preferred choice should not make your cooking experience a nightmare in using and cleaning, as the main purpose to reduce your efforts in the cooking process. The appliance should also be easy to operate, with one- touch or digital controls easily accessible and legible. The price of the stainless steel rice cooker must be justified by its functions. If it has few or no features, the price should also be commensurate. Ensure your preferred choice has the functions that you need, and the more, the better. With the key features to consider when purchasing a stainless steel rice cooker laid out, we look at the best of choices. The Cuckoo 8 in 1 Multi Pressure Cooker is more than just a rice cooker. Featuring leading- edge technology that has been developed for over 40 years of research, it offers you different types of cooking capability. The Cuckoo’s Inner pot is made of 304(18/10) stainless steel & aluminum base, which ensures even heat distribution. The Xwall nonstick coating on the inner pot protects the interior of your rice cooker from high temperature, pressure, and steam. The stainless steel detachable cover is more than a mere cover, as it has an inlet also made of stainless steel, that withstands the high temperatures, pressure, and steam during cooking. Cooking up to 10cups of rice, the cooker is not of average size. It weighs 16.5lbs, and measures 15.5 x 12 x 11 inches and will require a permanent place on your kitchen counter. It is a great appliance for family sized meals, or when entertaining. The Cuckoo is multi- functional, combines the functions of a pressure cooker, slow cooker, rice cooker, browning fry / sauté, steamer, food warmer, yogurt maker, soup maker to cook all kinds of food in a variety of styles, with no limits. It also provides a delayed cooking function, where you can delay your cooking time up to 12:50 hours with the preset function. It has customized settings with adjustable 9 heating options of temperatures from 35℃ to 125℃; and programmable timer from 1 minute to 12 hours). It has a 3 dimension (Lid, Bottom and Side) heating technology that heats food with radio frequency electricity emitted from the entire the pot. 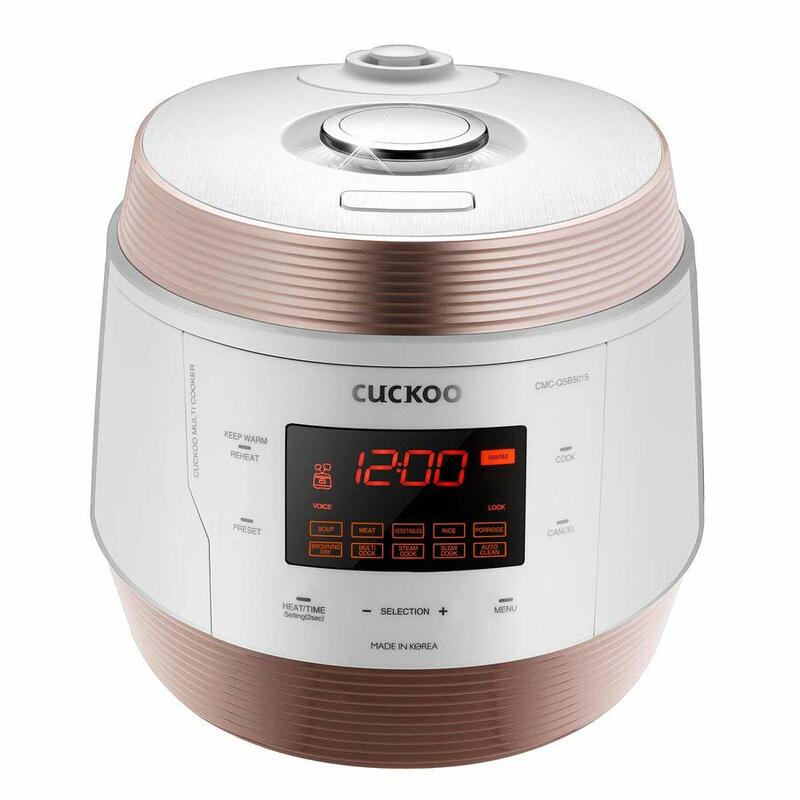 Operating the Cuckoo is made easy by the intelligent Voice Navigation system for English and Chinese. Not only is it interesting and friendly to use, it has an Auto steam cleaning function. With just a touch of a button, a strong jet steam is released to clean and sanitize the interior of the multi-cooker. Cuckoo’s innovative self-cleaning steam vents make cleaning the cooking pot a breeze. For just a small price there is great value offered by this multi cooker, and is aptly an investment. 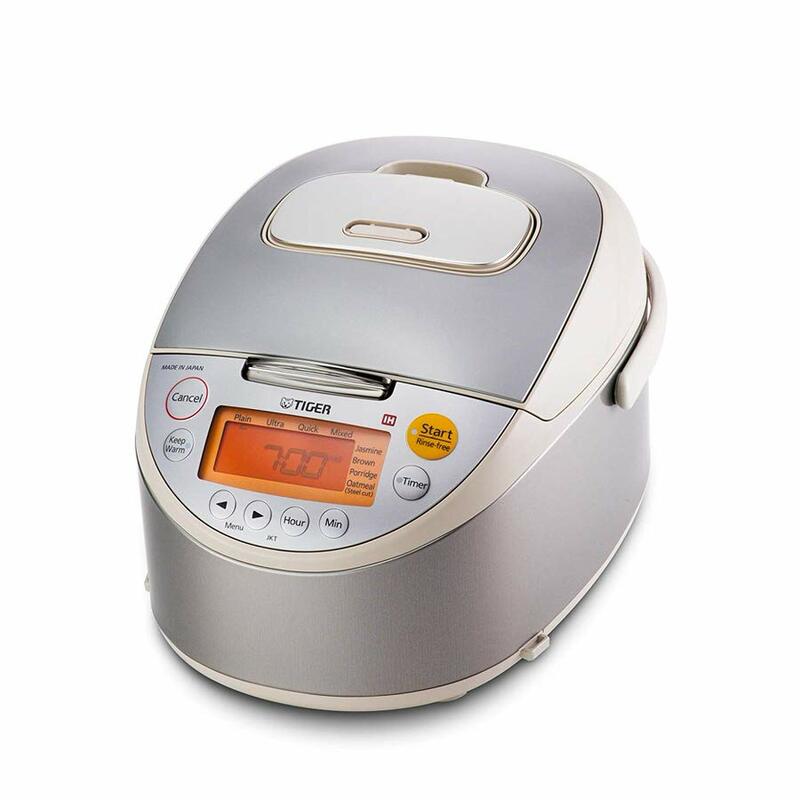 Using the coveted Japanese vacuum insulation technology, the Tiger JKT-B10U-C 5.5-Cup Stainless Steel Rice cooker uses induction heating to give perfect rice, while consistently monitoring cooking temperatures. The high quality 1.5 millimeters thick inner cooking pan features a multi-layered design for stable and even cooking. These are an aluminum alloy layer with an IR (infrared) coating, a stainless steel layer, and another aluminum layer sandwiched between them both. The inner cooking pan is non-stick coated, with a 1.5mm thick handle. With a size of 13.9 x 10.2 x 8.4 in and weighing 8.6 pounds, this is a sturdy appliance that requires a permanent place on your kitchen countertop. The 5.5 cups capacity is ideal for family sized meals. The cooker includes multiple cycles that make it easy to prepare your favorite rice such as white rice, brown rice, jasmine, and even mixed, and it keeps with warm without it drying out. Additionally, you can also program your rice cooker to prepare oatmeal. An extensive instruction manual is provided with your rice cooker, with detailed instructions on how to cook rice, oatmeal, and more. All your questions are answered here. It is quite on the higher side but sure is a great investment for your kitchen. The Aroma Housewares ARC-6206C Ceramic Rice Cooker is made with a 100% ceramic inner cooking pot for evenly and perfectly cooked rice. The rice cooker is made from stainless steel, and with the healthy ceramic inner cooking pot a better and healthier alternative to non- stick coated pans. With a capacity of 6 cups uncooked rice (12 cups of cooked rice), this rice cooker measures 11.2 x 14.8 x 9.5 inches and weighs 12.9 lbs. It will sit perfectly on your kitchen counter top, and will cook a meal for a medium or large sized family. The multi-function settings make cooking simpler, and are available for various foods such as white and brown rice, soups and stews, porridge, and more. It has an automatic keep-warm function too. To make any of your meals, rice, porridge, stews, soups and more, this multicooker is fully programmable with digital controls, enabling you to go about your life as the meals cook. The cooker has a lid that is easy to open, and the body has a cool-touch surface to ensure you won’t get burned even when the cooking process is ongoing. Produces excess steam which condenses on the edge of the lid. This can drip off onto the food. 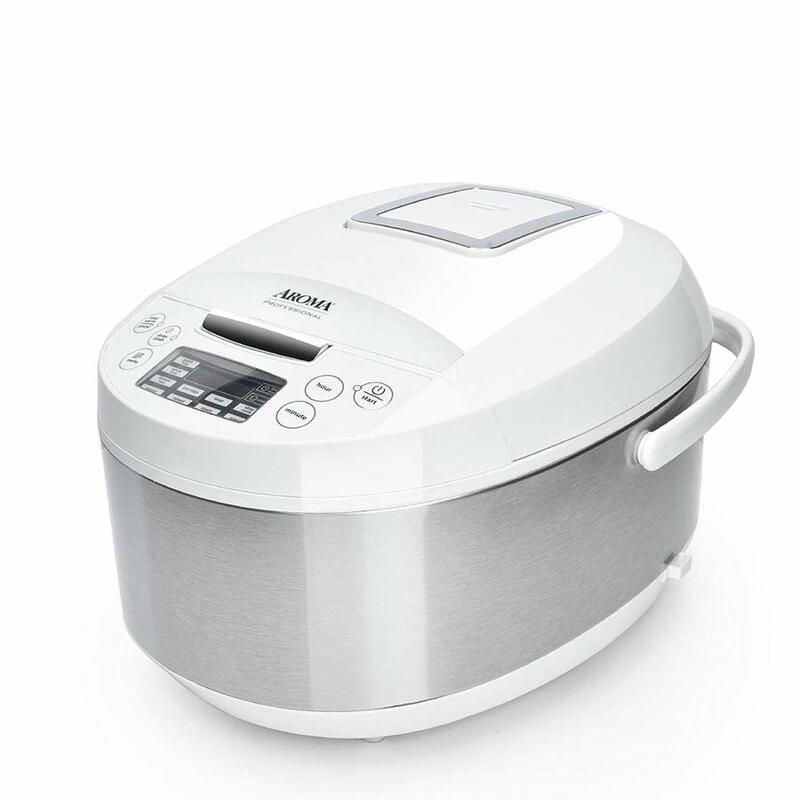 The Aroma Housewares ARC-6206C Ceramic Rice Cooker/Multicooker is fairly priced for its healthy ceramic inner pan alternative, and the various features that are all useful. If you’re passionate about and looking to create the deliciously popular “Persian Rice”, the Pars Rice Cooker with a removable Teflon non- stick pot is among the best in its class. The inner cooking pan is made of Teflon non- stick, and with the way the heat is distributed, makes the perfect crusty rice bottom. It is however not ideal for stews and soups. Measuring 11.1 x 11.1 x 8.8 inches and weighing 5.9 pounds, this Persian rice cooker is an ideal fit for your kitchen counter top, and what’s more, it is aptly able to make 10 cups of rice for your family in one cooking. The inner cooking pot has measuring lines that let you add water to the correct recipe measurements. And for the perfect “tah dig” (rice crust), a customizable timer is featured for your use. The Persian rice cooker comes with an instructional booklet for new users, and a recipe booklet to guide you in making that perfect Persian rice. An automatic shut off ensures your safety when handling it and not in use, as does the certified removable cord. The ‘keep warm’ function ensures your meals stay warm before you dine. The Persian Automatic Rice cooker retails at a fair value if you’re only looking to make Persian rice. Perfect specialty cooker for tahdig. Limited function. It is specifically for Persian rice, and is not a multicooker. The timer has a maximum limit of 1 hour. If your recipe calls for more time than that, you will need to add the time after the initial 1 hour. Instructional manual and recipe do not have a good English translation. Some guesswork may be required. Oyama CF-F12W is a seven-cup stainless steel rice cooker that comes with an aluminum- coated steaming tray. This appliance features a surgical grade 304 SS stainless steel body and inner bowl, with a triple-layered bottom, side and lid for uniform heating, which means your rice will not burn. The keep warm function keeps your food warm, if you will not eat soon after cooking. It is a relatively large rice cooker at 10 x 10 x 10 inches, with a 7-cup capacity that can be enough to feed an average sized family of four. The stainless steel construction is great for food release, there’ll be no food stuck on the sides of the cooking pot. No special washing is required, as it easily washes off the food remains the sink. Use non- scratch utensils and cleaning products to avoid scratching the stainless steel bowl. It is really great for its value. Relatively heavy in weight at 6 lbs. 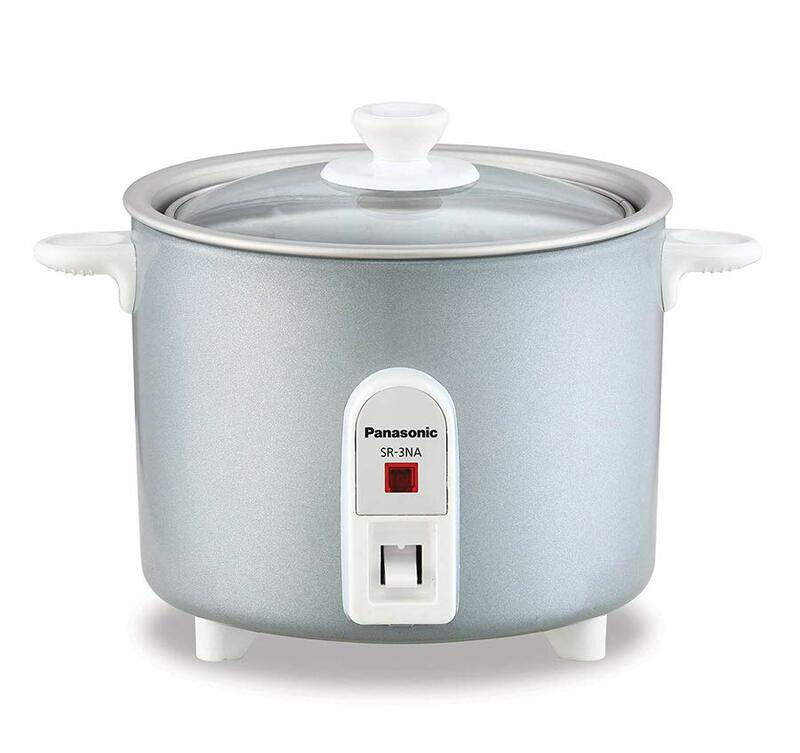 The Panasonic SR-3NA automatic rice cooker is a compact sized cooker with a durable non- stick aluminum coated inner pan, ideal for students, singles and busy professionals. An impressive heating technology supplies the necessary heat to the aluminum cooking pan, to cook the rice evenly. Aluminum is great, as it is known to heat up faster than other metals, for even heating and less thermal waste. Only a small amount of power to get the cooking going. The pan can still be used for warming once the food gets cold. The aluminum-coated inner pan is designed to withstand years of continual heat and use. Measuring 7.7 x 7.6 x 6.6 inches, and weighing only 1.9 lbs, you won’t require any extra space for storage. It fits perfectly on your counter top. It is quite a small sized rice cooker, with a capacity of 1.5 cups uncooked rice, this is an appliance for a small family, and singles. You can easily prepare your favorite dishes like oatmeal, soups, stews, and even mac n cheese. 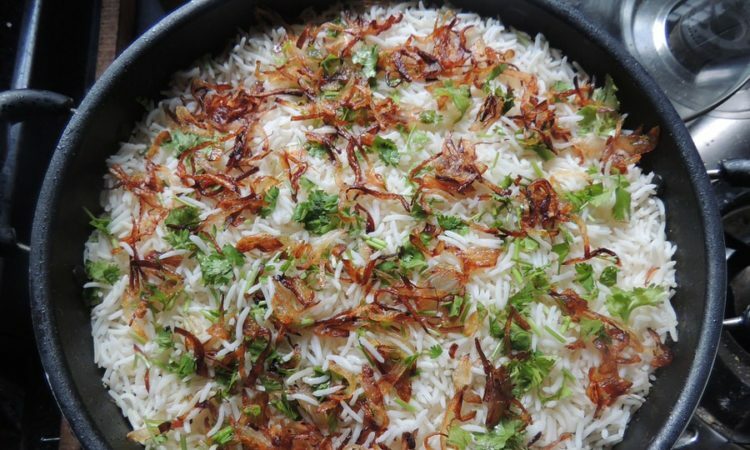 It is still possible to warm your rice in the event it gets cold, with the warm function and you will have a nice hot bowl of rice in a few minutes. The rice cooker comes with a measuring cup, has clear measuring lines (for water) in the inner pan, and has a see-through, tempered-glass lid that allows you to easily and safely monitor the cooking progress. It includes an automatic shutoff function, where the cooking stops when it is complete, and a cooking indicator light that goes off when the cooking stops. The price is more for the brand name since the capacity of this rice cooker is small. The auto-shut off feature has been reported to fail in some models, meaning you may have to keep your eye on the rice to avoid overcooking. The 1.5-cup capacity of uncooked rice is simply not a family- sized appliance. 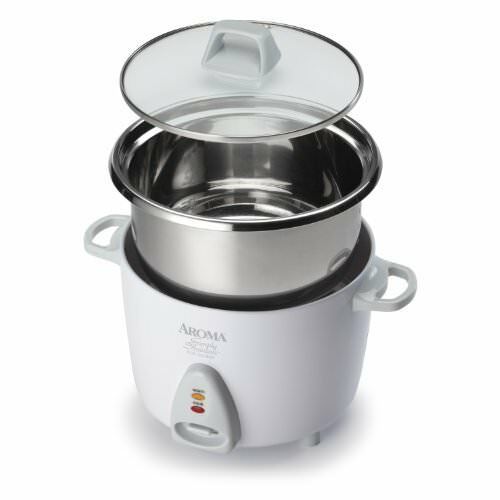 Aroma Simply Stainless 3-Cup Rice Cooker features a stainless steel pot, suitable for 3-cup uncooked and 6 cups cooked rice. It has a glass cover and plastic handle, and includes a rice measuring cup and serving spatula. 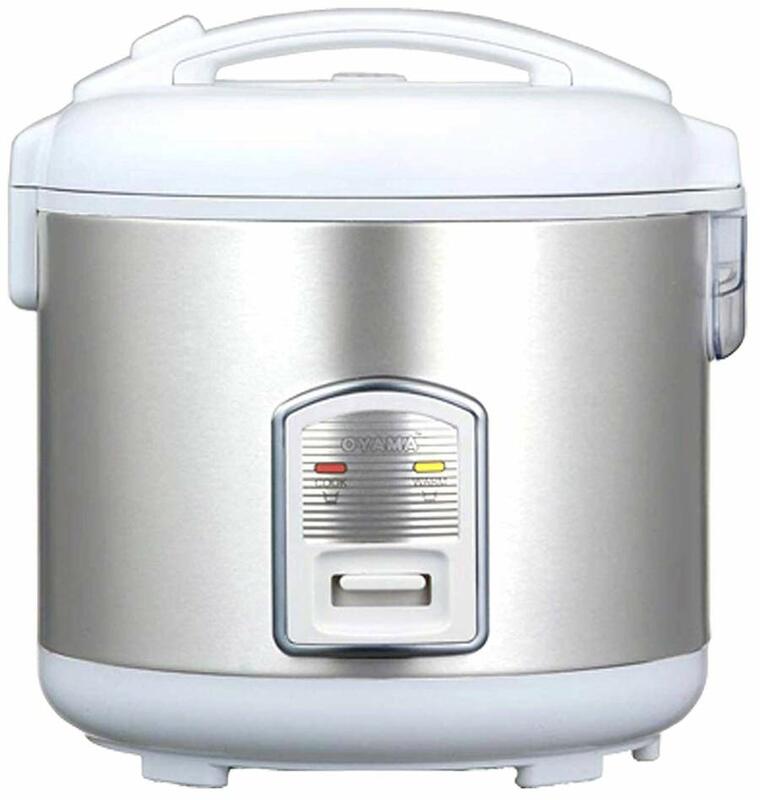 This rice cooker features a 304 SS surgical grade stainless steel inner cooking pot. With a size of 8.2 x 8.1 x 10.3 inches and weighing 4.2 lbs, this is a relatively large cooker, without much weight. With a 3 cup capacity for uncooked rice, it can easily feed a family of four. 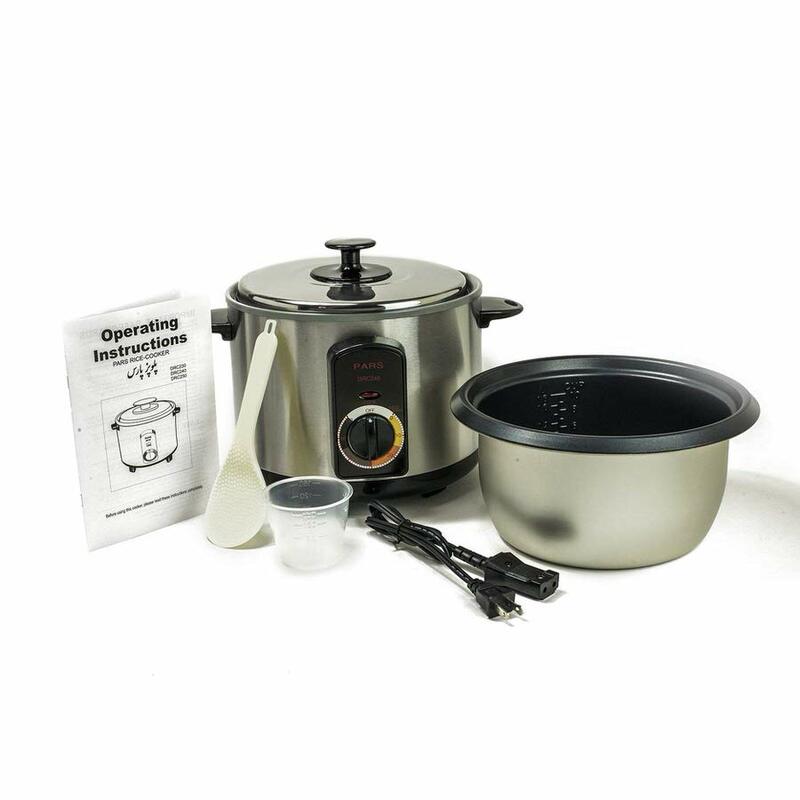 This rice cooker will also cook your one pot meal combos of up to 6 cups, oatmeal, chili, jambalaya, soups and more. A one switch operation for cooking and automatic keep warm function are the only functions. The inner cooking pot and all accessories are removable for easy cleanup in the dishwasher, or hand wash with warm soapy water. The rice cooker comes with measuring cup and spatula. This is fair pricing for a no frills cooker. Basic rice cooker, no steaming unless you purchase steaming tray separately. Rice measuring cup is 6oz., not a standard size. Having reviewed the features of 7 of the best stainless steel rice cookers, you can now make an informed choice on what will best work for you. When you do make your purchase, happy rice cooking!